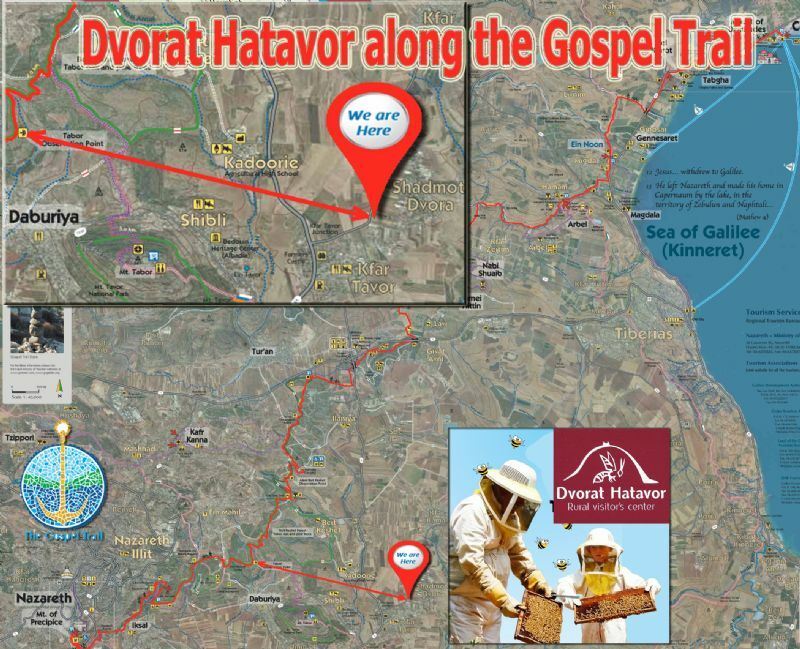 An authentic silk & honey farm located in moshav Shadmot Dvora at the foothill of Mount Tabor (very close to the Gospel Trail) in the Lower Galilee - Dvorat Ha'Tavor is a unique visitors center. This Israeli boutique honey farm offers educational programs and family activities. Inviting visitors to join a live demonstration of the production of honey and silk (the only active silk farm in Israel) as it was done by the Ben Zeev family since the moshav was founded in 1939 as part of the original tower and stockade villages. The farm is open to the public daily from 09:00 to 15:00, all year long thanks to the Mediterranean climate. The honey harvesting season happily coincides with the summer vacation and high holidays, which makes seasonal honey festivals a popular attraction. You are more than welcome to call ahead and schedule a complete tour in English. The tour which includes an explanation regarding the honey production as well as the healing capacities of honey and other bee's products, includes also a visit to the beehives observatory where the actual bees can be observed without any danger of getting stung, a visit to the silk growing facility and activities for children which are suitable for children from the age of 3. The farm which is a known tourist attraction for more than 20 years was redesigned to accommodate visitors with special needs. It includes all the necessary facilities such as parking, toilets, kiosk and a gift shop where you can find pure Dvorat Ha'Tavor honey, souvenirs & honey gift baskets which are a common holiday present among Israelis. Moshav Shadmot Dvora ("Dvora" named after the biblical prophet Deborah who fought Sisera at the foot hill of Mount Tabor) is conveniently located off road 65North, 20 to 40 minutes drive from a lot of the main attractions in the Galilee such as the Sea of Galilee, the Jordan River, Nazareth, Tiberius and Mount Tabor. We look forward to seeing you during your next trip to Israel whether you are here to walk the Gospel Trail, for a family visit or just looking for authentic off the beaten path locations in Israel. דרך הבשורה הוא נתיב הליכה ארוך בגליל התחתון ובצפון הכנרת, המקשר בין אתרים קדושים לנצרות שנפתח ע"י משרד התיירות בסוף שנת 2011 השביל מתחיל בשביל הבשורה בנצרת בהר הקפיצה, ויעדו הוא חופה הצפון-מערבי של הכנרת. דרך הבשורה עוברת בשטחים פתוחים בסמוך למספר ישובים ומספר אתרים קדושים לנצרות. אורכה של דרך הבשורה הוא 62 ק"מ, והיא מיועדת להולכי רגל, רוכבי אופניים ורוכבי סוסים. מטרתו של השביל היא לספק נתיב הליכה נוח ומסומן המקשר בין אתרים משמעותיים בחייו של ישו בצפונה של ארץ ישראל, כפי שמתוארים בבשורות על-פי מתי,לוקס ומרקוס. יוזמי השביל מציינים אודותיו כי: "השביל נוצר במטרה להפוך לטרק ברמה בינלאומית, ולהוות במה ללימוד היסטוריה ורוחניות, גשר לקירוב אנשים בעלי רקע שונה, ולעידוד תקשורת ביניהם. אנו מציעים חוויות ושירותים אתיים וזמינים לכל האנשים. השביל אינו מקדם חזון דתי או פוליטי ואנו מנסים לעבוד עם אישים, עם ארגונים מקומיים ובינלאומיים בעלי נקודות מבט שונות." What is the Gospel Trail? 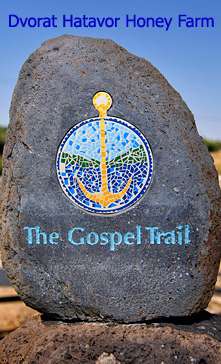 The Gospel Trail provides an opportunity for anyone on foot or mountain bike to enjoy the physical and spiritual experience of following in the footsteps of Jesus through the beautiful, historical landscape of the Galilee. The trail begins in Nazareth, Jesus’ hometown, and leads to Capernaum on the shores of the Sea of Galilee (Lake Kinneret), by way of rustic roads and pathways that have been trod since ancient times by shepherds, farmers and villagers; travelers, merchants and pilgrims; armies, kings and prophets, by Jesus in his day.